I do love books. I love displaying them, reading them, and staring at them stacked in a pile, waiting to BE read. The books I have fall generally into two primary categories - mysteries and decorating. I like cook books as well, but they fall a somewhat distant third in line. I've either purchased or received several books lately and I wanted to share them with you. I'm sure some of you may have a few of these, but hopefully I can pass along some information about a book you haven't seen before. First off, the stack. I just received "French Inspired Jewelry" by Kaari Meng, and "Crowns & Tiaras" by Kerri Judd & Danyel Montecinos. Both are very fun and real candy for the eyes. I don't know that I would ever be able to create the level of crowns or jewelry found in these books, but I can certainly enjoy looking at it and maybe even try. They both give how-to information, although there are no pictures that walk you through the process, just the end-result picture. The layout of both books is quite pleasing and they both use great colors and styling for the pictures. I received "Merry & Bright" by Country Living for my birthday in December. I really like the book very much and highly recommend it. There are great pictures and ideas, which do come from a compilation of the Country Living magazines from over the years. 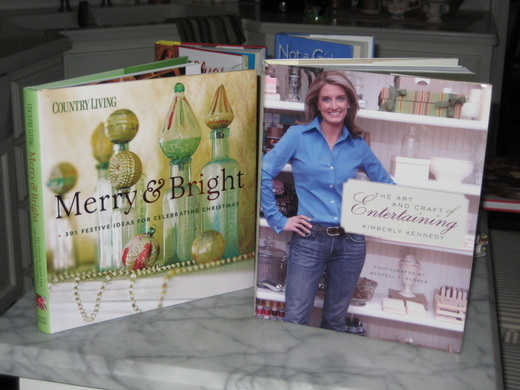 I also just picked up "The Art and Craft of Entertaining" by Kimberly Kennedy at a recent antiquing excursion. It was just a few bucks and is only from 2006. I very much like this book as well and think she has a lot of great ideas about style, decorating, and entertaining (from invitations to the actual event). I don't really "entertain" that often, but it's still nice to get ideas for dinner parties, showers, luncheons, etc. I received "Modern Country" by Nancy Ingram and M.J. Van Deventer from my step-son Alex for Christmas. I had wanted it, but hadn't really looked through it before. I am feeling so-so about the book because I definitely liked some of the pictures and styles, but was a bit ho-hum about other settings. I have to say though that everytime I look through it I do find more that I like. If anyone else has the book let me know what your impression is. Maybe my deal is that I like more "stuff", not clutter, but "stuff" in my decorating. Anyway, can't quite put my finger on it. My friend Christy picked out the Nancy Drew book for me - she knows me well! It is a newer book and she knew I would enjoy it - I totally do Christy :o) I have a somewhat large-ish collection of Nancy Drew-related items and am always happy to read about Nancy Drew and add to my collection. The book is quite fun and even has a few recipes in it, including pot roast. Speaking of which, not about pot roast, but Nancy Drew, for anyone waiting for the Nancy Drew movie to come out on DVD, it will be released on 3/11. We have pre-ordered it and eagerly await its arrival. In addition, Steve just got me the above book "Not a Girl Detective" by Susan Kandel. It is about an auther who writes autobiographies about dead mystery writers. "Not a Girl Detective" is about one such mystery where the character is researching "Carolyn Keene". The character wears great vintage clothes, drives a baby blue vintage Cadillac, and gets involved with a murder having something to do with one of the original blue Nancy Drew books (the "Blue Nancys"). Not only does Christy know me well, but clearly my husband knows me well too. I didn't know this series existed, but he found it and ordered two of them for me. The next one is on its way and has to do with Perry Mason. I haven't read this one yet, but plan to after I finish my current book. As you can see, I'll be quite busy reading, which is a great problem to have. Looking at a stack of books just brings a smile to my face. I wanted to answer a few questions that I received comments and emails about over the past few weeks. I've been quite neglectful about getting back to people, but some questions were asked three and four times so I thought this might be the proper place to answer them. 1.) I received several questions about the colors on the wall in the kitchen, dining room, and living room. I'm sad to say that I don't know what the names are. They were custom blends. The kitchen is a camel color, which is also on the bottom half of the family room (the upper half of the family room is a charcoal color - it's a nice contrast). The living room and dining room are both a light grey and have cream-colored crown moulding. 2.) Candles on the island in the last post - did I make them, and how to do it. I did make them. It's very easy. All that is required are orange slices, pieces of an evergreen branch, cranberries, and floating candles. Add them all into a glass container, fill with water, and add the floating candle on the top. 4.) Black cabinet in the below post. I was asked if it is a pantry. It is at least 100 years old and was on my grandparent's farm. It holds baskets with aprons and cloth napkins, and is also where we store large serving bowls and our bills. Here is an additional picture. 5.) The kitchen island in my below post was also the source of several questions. We got it several years ago from Williams-Sonoma. They don't seem to carry it any longer though. It has three drawers on one side, a marble top, and a shelf on the bottom for holding our pots. Here are some additional pictures. 6.) Cynthia had mentioned Nell Hill in a comment she left for me. I'm sorry, but I don't know if Cynthia has a blog or not, otherwise I would add a link to it. It's funny that she said I have a similar style to Nell Hill because I very much wanted her Christmas book for my birthday, but it was nearly impossible to get. Both Steve and Alex searched around for it, but they were quite expensive. I see now that it is going for about $60. So, maybe later I will be able to get the book, but I did very much enjoy the comment from Cynthia who actually gets to work in the Nell Hill store in Kansas City. How fun would that be ! 7.) I was asked about our kitchen table and chairs. They are from Pottery Barn, and are a distressed black color. My sister-in-law didn't realize we had purchased it distressed. When she first saw it she thought the paint had already started coming off. I'm sure it was very hard to understand why we would actually pay to have our table look like it had been roughed up. I heard from a few people who were commenting about painting their kitchen tables, which I'm sure would look great. We really do love ours. 8.) Lisa left me a comment several posts ago asking about our entry wall that goes up the stairs. She asked if it was wallpaper. It is actually paint. I've included a link to a past post that shows a close-up of it. Again, I didn't have a link to a blog for Lisa so I apologize for not being able to include a link to her. I didn't take any photos of my closet, but I did capture a couple of shots of my newly organized bathroom drawers. Opening a clean, organized drawer is not only a relief to the eye, but is very gratifying. My newly appointed makeup drawer. I used to have everything crammed into a smaller drawer. I never knew where things were. Now I don't waste time hunting around. I use the vintage box on the right to hold my hair bands, ribbons, clips, etc. It's nice to have it handy, yet covered so you don't see all of the individual items. While getting the organizational baskets for my drawers at Target, I also picked up this Simply Shabby Chic fabric basket to corral some of my many books. Hey, there's another journal I made stuck in between the books. Wanted to share a few favorites with you. My favorite skin care is Arbonne's Nutrimin C line. It's really great. I also use Proactive to combat acne. I use to have adult acne, but the combination of Proactive and the Nutrimin C line has really changed my skin all together. In addition, I use Bare Minerals instead of traditional foundation, which I absolutely love and would never go back to regular foundation. At night before I go to bed I use a Bare Minerals product called Rare Minerals. I used to have sun spots on my cheeks and a couple on my forehead. Those spots are gone now. I was really surprised, quite happily. These are my Bare Minerals I was talking about. As I said, I would never go back to regular foundation. I also use the blush, and eye shadows, and as I mentioned the Rare Minerals at night before I go to bed. My favorite lip therapy: Co. Bigelow from Bath and Body Work. They feel good, taste good, and make your breath smell good too.